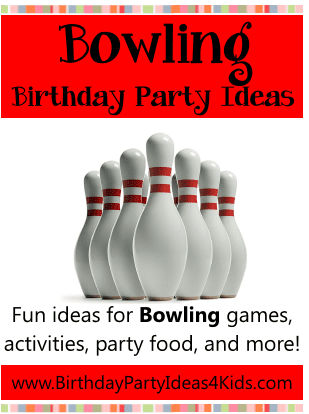 Bowling parties for kids can be lots of fun - here are some ideas to make them even better! To make bowling even more fun try some of the unique games listed to play on the lanes while the kids are bowling- try a different game during each round of bowling. We've included FREE print-outs of the games Bingo Bowling and You Must Bowl. Follow the links that are listed under the Bowling game directions below. 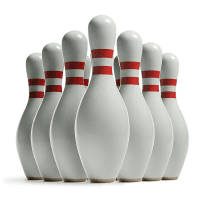 Buy a set of inexpensive plastic toy bowling pins. With a permanent marker write the details of the birthday party on the pin. Hand out to party guests. Cut bowling balls out of black construction or cardstock paper. Leave the top of the circle connected to make a card. Decorate with white paint pens by drawing three small circles in a triangle shape to symbolize the holes in the bowling ball. Write party information inside with a white paint or gel pen. Tip: If you are having the birthday party at a bowling alley tell guests on the invitation to arrive 15 minutes before your bowling time is to begin. This is will give everyone a chance to find a ball, pick out and put on bowling shoes, and get ready to start. This will save all the bowling time you've paid for for actual bowling. Great colors for decorating bowling parties are red, white and black (pins, bowling ball and red stripes on the bowling pins). Cover the tables with red plastic tablecloths. If you can't find bowling themed tableware use white or black plates (bowling balls). Create awards to hand out after the bowling party. The bowling awards can be a small trophy or a paper certificate. Keep track of the bowlers during the party and assign each guest to a funny bowling award. Have an awards ceremony during ice cream and cake and hand out the awards. "Strike it Rich" award for the most strikes - cash, gift card or trophy filled with dollar bills. "Spare Change" award for the most spares during a game - change purse or bank filled with coins. Gutter Ball Award - to the bowler with the most gutter balls - sunglasses or bowling towel to hide their head. Slowest Ball - For the slowest bowler, or slowest ball down the lane - plastic or stuffed turtle. Fastest Ball- for the fastest bowler or fastest ball down the lane - plastic or stuffed rabbit. Closest to the Mark - decide on a number before the game starts, say 75, and the bowler closest to that number wins - trophy or a small darts set. Players use Bowling Bingo cards to keep track of the bowler's scores. The first one to cover squares in a row either horizontally, vertically, or diagonally wins! Print - 2 to a page - a square divided into 25 smaller squares. In the middle square write in the word "FREE". In the squares write in different things that can happen during a typical game. On each card mix up the items so that all the cards are different. Use bowling theme stickers or colored dots as markers. Whenever something happens that is written on the card during the game the children mark off that square. The first one with 5 across, down or diagonally shouts out BINGO and wins a small prize. strike, spare, 7 - 10 split, gutter ball left side, gutter ball right side, pin # 7 only, pin #10 only, 2 pins down, 3 pins down, 4 pins down, 9 pins down, 2 strikes in a row, super slow ball, super fast ball, strike in another lane, score 40 points, score 70 points, 5 pins down, 6 pins down, 7 pins down, 8 pins down, gutter, gutter, spare, strike. Here is a sample of a Bowling Bingo card you can copy and then change the order of the items. Before the party write down as many crazy ways to bowl as you can think of - cut the ideas into strips and place them in a hat or container. During one of the rounds of bowling have the guests choose a piece of paper and they must bowl their two frames by doing the action that is on the paper. Some fun ideas are: Act like a frog, Act like a ballerina, Frankenstein walk ... and many more. Once the guests have gone through all the ideas place them back in the container and use them again. Here are 25 fun ideas for "You Must Bowling Game" that you can print out.